October 23, 2009, Washington— Along with counterparts from around the world, the Federal Aviation Administration (FAA) led the U.S. delegation in recent meetings at the International Civil Aviation Organization (ICAO) in Montreal that resulted in an agreement that will guide the global aviation community as it tackles the challenge of climate change. “The agreement reached on Oct. 9 at ICAO is a significant milestone for the aviation sector in addressing its contribution to greenhouse gas emissions,” said FAA Acting Administrator for Policy and Environment Nancy LoBue, who participated in the meetings. 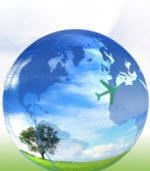 The countries participating in the agreement adopted a program of action to reduce aviation greenhouse gas emissions. In particular, it features an agreement to strive for a 2 percent annual fuel efficiency improvement between 2012 and 2050, calculated on the basis of volume of fuel used per revenue ton kilometer performed. This commitment represents an improvement of more than 60 percent over that period. In addition, ICAO, the United Nations agency that oversees civil aviation, identified a broad range of measures available to all states that can be used to limit and reduce greenhouse gas emissions from international aviation. The group also called for reporting on air transport traffic and fuel consumption by all states, which will allow ICAO to monitor progress toward the global goal. This is the first time any industry sector in the world has made such a commitment on a global level. The high- level meeting also encouraged states to submit to ICAO reports on the measures they are taking to contribute to the global goal. The meeting of the world’s aviation authorities also agreed to an ambitious program of action beyond these initial steps. In the next year, ICAO will develop recommendations on carbon-neutral growth and long-term emissions reductions for the international aviation sector. States have agreed to develop an international framework for the use of market-based measures in international aviation and ICAO has committed to explore how best to address the special needs of developing countries. The United States will continue to work to find effective and cooperative approaches for aviation to meet the challenge of climate change.